Each $72 box contains 24 packs. Each pack contains 5 cards. 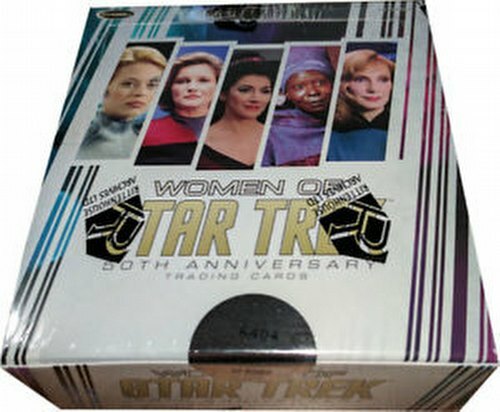 Each box of The Women of Star Trek 50th Anniverary trading cards includes 3 autographs and 1 costume card. Signers include Vanessa Williams, Whoopi Goldberg, Marina Sirtis, Jeri Ryan, Yvonne Craig, Julie Warner, and more! Costume cards include materials from Guinan, Seven of Nine, T'Pol, B'Elanna Torres, Beverly Crusher, Jennifer Sisko, and others, plus a Bonus costume card of Yeoman Rand. Sketch cards can be found 1 per case. Artists include Dan Bergen, Chris Meeks, Kevin Graham, Mike James, Emily Tester, Warren Martineck, Mick and Matt Glebe, and more! 100-card foil base set. Bonus sets include a 100-card numbered Metal Base Parallel set, a 9-card Women in Command set, an 18-card Quotable set, and an 18-card numbered Gold Metal set. Case incentives include a 6-case Nichelle Nichols autograph, a 9-case Charles Hall Base Parallel Sketch card, and an 18-case Archive Box (including exclusive Teri Garr auto, Seven of Nine costume card, and set of 4 base set color printing plates.